At Hanford Hyundai, we’ll show you why the Hyundai Elantra GT is a popular hatchback. There are two trim levels for you to choose from, offering you all sorts of standard and available features. The Elantra GT has an inline 4-cylinder engine with 161 horsepower. It includes a few optional safety features, a blind spot mirror, projector headlights, and 17-inch alloy wheels. Are you in search of a new crossover SUV? At Hanford Hyundai in Hanford, CA, our team studies our vehicles carefully to provide our consumers with detailed information about the features that come with our models. The Hyundai Santa Fe is a popular crossover SUV because it offers a number of safety features that you can read about below. The Hyundai Veloster has been a head turner since its introduction in 2011. 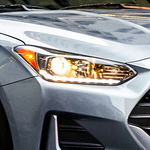 The Veloster is a truly unique, 3-door sports hatchback coupe that blends sporting performance with real-world economy and utility. The 2019 Veloster continues to be aimed at the young and hip with a focus on smart features, edgy styling and spirited performance in a package that is very easy to live with. While this theme is at the heart of the Veloster identity, there are several trim levels available that allow buyers to fine tune their flavor of choice. The 2019 Hyundai Accent is a stylish and popular midsize sedan. 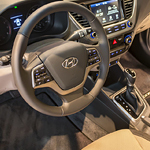 Like many Hyundai offerings before it, the Accent provides occupants with surprising amounts of interior space as well as a number of useful connectivity features. On the interior space front, the Hyundai Accent offers a surprisingly large 13.7 ft. of interior trunk space. Accessing the trunk is easier with the available hands-free power trunk lid. In addition, the Accent includes split-folding rear seat capability. This feature allows occupants to load longer and bulkier items into this useful sedan. How Convenient is a Car Cover? A car cover only takes a few minutes to place on your vehicle. It is longer than not covering the car at all, but the benefits are well worth it. We at Hanford Hyundai like to keep our community informed about good ways to keep cars clean and protected. Using a car cover can help you prevent the long-term effects of the sun and weather. Traveling with your pet can be an exciting and extremely fun event but only if it’s done safely. The safer your trip, the more enjoyable it will be for you and your pet. We at Hanford Hyundai want both you and your pet to reach your destination safely and are here to offer you some safety tips. Do not let your dog hang his head out the window or sit in the front seat. Keep the dog confined in the back seat. Do not let the dog move around freely in the vehicle or sit on your lap. The 2019 Hyundai Santa Fe is an exciting compact SUV that is built for adventurous drivers in Hanford. With its sporty exterior, impressive cabin, and powerful drive, the Santa Fe is quite the head turner, and it offers you five trim levels and a variety of available features. If all these options seem intimidating, just check out our quick breakdown of the major features on each trim level to see which model is for you. Why should you buy a new Hyundai Elantra GT? One good reason is that this vehicle is among the most popular in its class. It has an interior full of features that are designed to make your ride as easy as possible. For example, it has heated seats for both drivers and passengers to enjoy on a chilly spring morning or cold winter night. Consumers who are all about safety often find the Hyundai Tucson to be a perfect choice. This popular crossover SUV was also designed with the latest technology features. Stop at Hanford Hyundai and speak with one of our salespeople. You’ll be amazed at what a great value the Tucson can be. The Hyundai Kona is a popular crossover that’s the ideal choice for someone who wants the size and comfort of a car with the capabilities of an SUV. The Hyundai Kona, which offers America’s Best Warranty, is a great value for the money. Stop at Hanford Hyundai and check out the Hyundai Kona at your earliest convenience. When you buy a Hyundai Kona, you can be assured it comes with a great warranty – 10 years/100,000 miles on powertrain; 5 year/60.000 mile new vehicle warranty and 24/7 roadside assistance for 5 years.